Loewe Individual Slim Frame TV has a million options | What Hi-Fi? 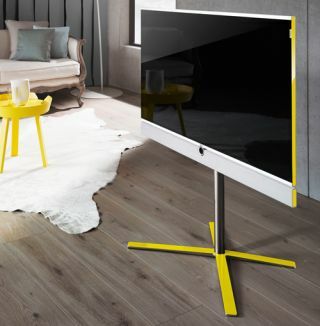 Loewe claims its new Slim Frame (SF) TV range is available with "more than a million options", depending on the colour, materials, screen size, speakers, networking or multimedia options you choose. Now we haven't been able to put that claim to the test ourselves, but what we do know is that the Individual SF range comes in three sizes: 40, 46 and 55in. All models are equipped with Full HD LCD, active-shutter 3D screens with LED backlighting and 400Hz picture processing. An extremely thin bezel means nearly all of the front of the TV is given over to the screen, and the minimalist look is the work of Phoenix Design in Stuttgart. Audio options are plentiful: the set comes with eight integrated speakers housed in a separate soundbar under the screen, delivering 2x40W stereo sound. If you want surround sound, an integrated multichannel decoder with AV preamp means the Individual SF can be the control centre for your home cinema system. Individual Slim ID stand speakers are optional, in a choice of aluminium black, aluminium silver and gloss white. If used, the speaker bar under the screen can be adopted for centre channel duties. A new operating system, Loewe Assist Media, gives control of TV programmes, internet content, photos, videos and apps. In addition, Loewe MediaNet handles audio and video on-demand services, news portals and social media apps such as Facebook and Twitter. An integrated 750GB hard-disk recorder can store your favourite programmes in 2D or 3D, and stream recordings to other Loewe TVs via WLAN, LAN or Powerline. Triple digital tuners allow recordings to be made while watching another programme. The Loewe Individual SF range is available now in gloss white, aluminium black, aluminium silver and aluminium titanium finishes. Prices start from £2800 for the Individual 40, £3700 for the Individual 46 and £4600 for the Individual 55.